Let’s do this! 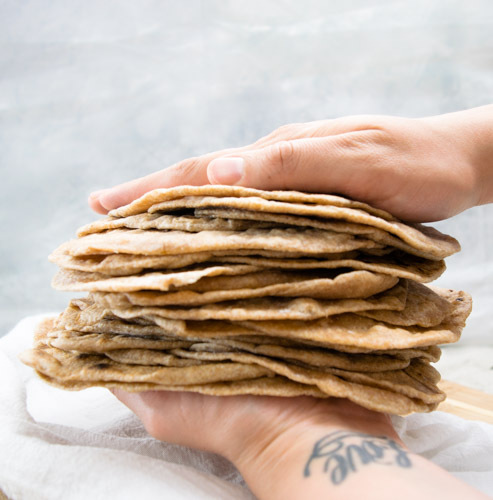 Today you’re going to make homemade whole wheat flour tortillas and you will love it! It’s simple, anybody can do it! It’s so much better than anything you’ve ever bought at the store. I make this 3 or 4 times a month, because we really love tacos at my house. 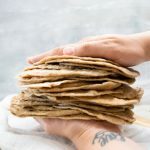 This is the best whole wheat tortilla recipe I’ve ever made, and I have experimented with quite a few. It’s 5 simple ingredients and about 1 hour of your day between making the dough, resting it, rolling and cooking, which isn’t bad at all. Even faster if you have a tortilla press. You can find some really cheap ones on amazon, around 12 dollars! A bargain! I usually roll mine out by hand. I like the rustic look and shape, it screams homemade. 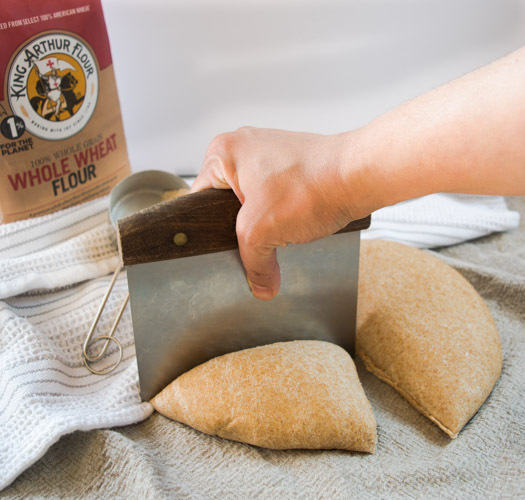 About the flour, this recipe I bring to you today calls for 100% whole wheat, but you can sub any or all of the flour for all-purpose. I do like to combine both sometimes because it gives the tortilla a nice color. But you do you, my friend. Use whatever flour suits you. It will be delicious, regardless! These tortillas will keep for a few days in the fridge, well covered in plastic. If we have any leftovers, I like to cut them into triangles and bake them or even fry them, if I’m feeling particularly naughty with my calorie consumption. But that’s once in a blue moon, they are really delicious simply baked. Cut them into triangles, mix them with a splash of olive oil, a sprinkle of salt, pepper, paprika, garlic powder and bake them for 5-8 minutes in a pre-heated 375ºF oven. Taco tuesdays will never be the same after you make homemade tortillas! 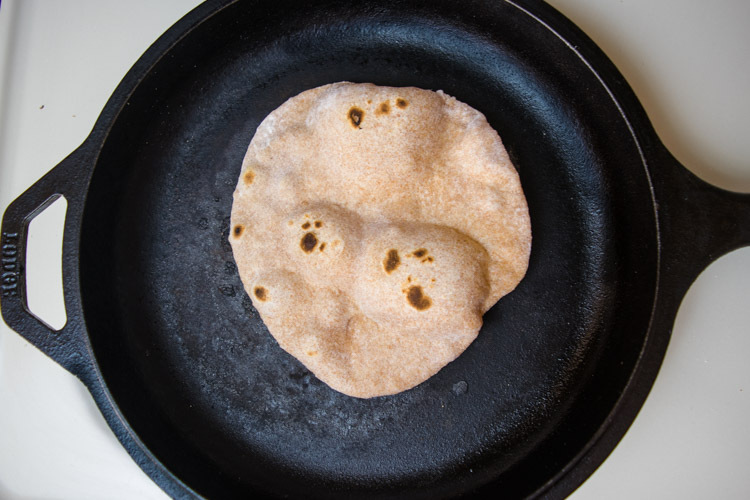 Store-bought tortillas will never compare to this recipe for homemade tortillas. 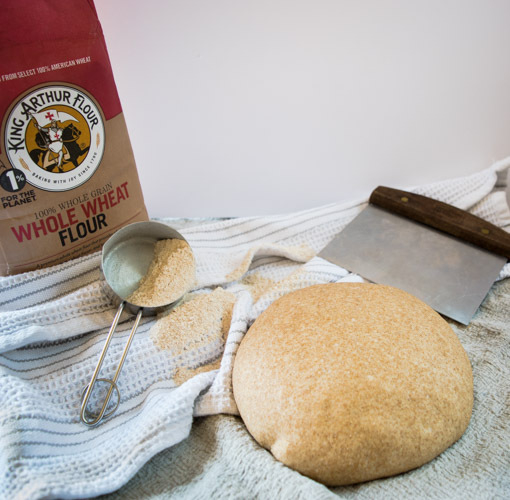 You can use 100% whole wheat or a combination with All-purpose flour. Mix the flour, salt and baking powder. Add water and oil. Mix until incorporated, form a ball and knead by hand for 2 minutes or 1 minute on low speed on stand mixer. Transfer to lightly floured counter and cut into 16 equal pieces. Roll each piece into a ball and try to flatten each ball into a disc by pressing down with your fingers. Cover with a clean towel and let them rest for 15 minutes. Heat a cast iron pan. Use a tortilla press to make the tortillas or roll out by hand into a 8 or 9 inch circle. Cook each tortilla for one minute on hot pan, flip it over and cook for another 30 or 40 seconds. Remove the tortilla and fry the next one. I roll out a couple of tortillas and then start cooking them, the time to roll out a tortilla is exactly the time it takes to cook the first side, so I roll out as I cook them. Keep the tortillas in a tortilla warmer or a covered container while they all cook. Keep it in the refrigerator for 4 or 5 days.